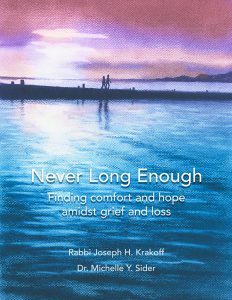 It was one of the first things Rabbi Joseph Krakoff learned in his pastoral care work at the Jewish Theological Seminary: When a loved one dies, those left behind always wish they’d had more time. While he was still a seminary student in the late 1990s, he wrote a poem, “Never Long Enough,” that expresses those feelings. Where have the years gone? It seems like only last month we were laughing, sharing and guarding each other’s precious thoughts. He would sometimes read the poem at funerals (without noting that he wrote it), and mourners told him they liked it. About three years ago, Krakoff asked Huntington Woods resident Michelle Sider to look at his poems. Thus, began a collaboration that resulted in the publication of Never Long Enough, a richly illustrated version of Krakoff’s poem. Krakoff, senior director of Jewish Hospice and Chaplaincy Network, and Sider, an artist and psychotherapist, met about 12 years ago on a Jewish Federation-sponsored trip to Israel. 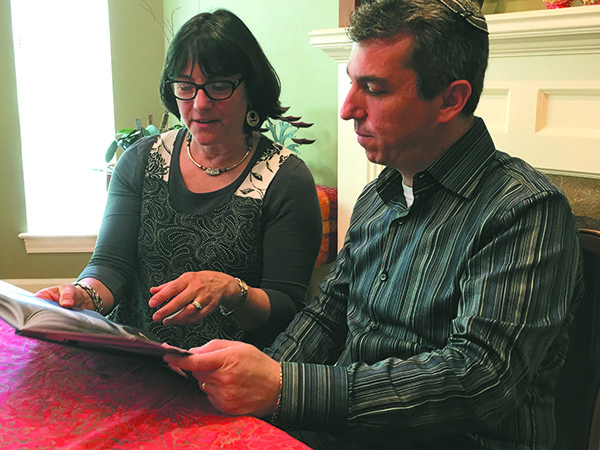 A few years later, Krakoff’s daughter, Atara, was in Sider’s art class at Frankel Jewish Academy in West Bloomfield. Sider said her aim in illustrating the book was to give readers a visceral impression of the words. “They can experience the grief, but also the joy from the memories they have,” she said. Sider created about 50 drawings and paintings, then she and Krakoff decided which 31 to use. All the pictures are full-page — some take up two pages — and illustrate a short phrase or even a single word. If only we could share one last word, one last touch, one more hug … one final kiss. The illustrations progress from black-and-white into partly colored and then brightly colored pictures to parallel the progression through the mourning process. Many of the illustrations are personal, Sider said. One was created after her oldest son left to join the Israel Defense Forces. The cover is a view from the pier in Petoskey. Another is from a photo Sider took in Alaska. “She said, ‘Your book has settled me and now I feel I can go on. You’ve given me my future,’” Sider said. 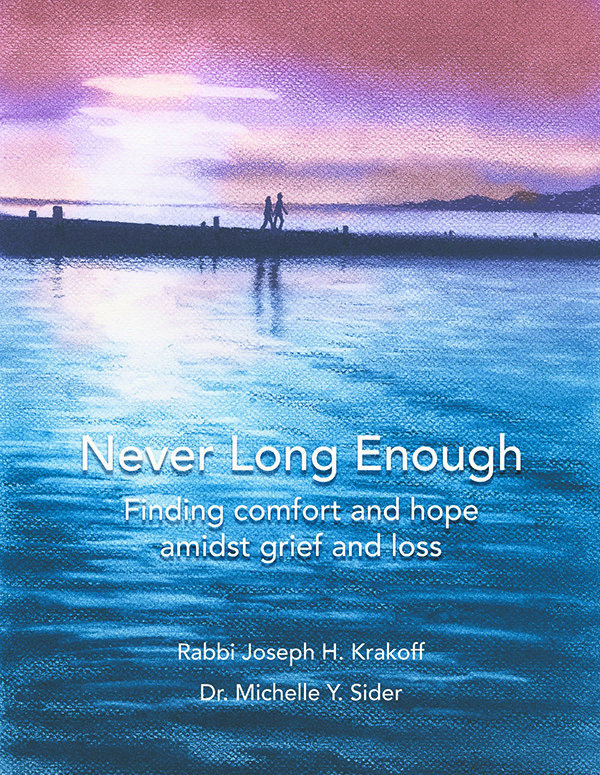 Although originally intended for mourners, Krakoff and Sider realized the book could also help with “life review,” an important component of hospice care. People nearing the end of life can use the book to help them think about what in their life has had the most meaning. In the published version, there is a presentation page in the front for a written dedication to a friend or loved one, and four blank pages at the end for memories and reflections. “It invites people to have conversations together,” Sider said. There are never enough years. Yet I will forever be thankful we had each other. Those beautiful and cherished memories will be written on my heart forever. The book is intentionally not religious so that it can be relevant to readers of all faiths — or none, Krakoff said. Promotional materials include laudatory blurbs from Rabbi David Wolpe of Sinai Temple in Los Angeles, Archibishop Allen Vigneron of the Archdiocese of Detroit and the Rev. Kenneth Flowers from Greater New Mt. Moriah Baptist Church in Detroit. Rabbi Jeffrey Falick of the Humanistic Birmingham Temple told Sider and Krakoff he thought the book was perfect for Humanistic congregations and other atheists. Sider and Krakoff chose a Michigan company, Front Edge Publishing, to publish their book. Individual copies are available in soft-cover for $19.95 and as a premium hardback for $29.95 through Amazon and Barnes & Noble. Discount bulk copies can be purchased through the publisher (info@frontedgepublishing.com) and can be customized for congregations, funeral homes, hospitals, hospices and similar organizations. Krakoff and Sider are thinking about producing a line of greeting cards using some of the text and pictures from the book. They’re already working on an art therapy version of the book, in which all the pictures will be pages readers can color themselves.